In 1880, Arthur Freemont “A.F.” Gilmore borrowed $500 and with a partner bought a 256-acre parcel of land and started a dairy farm. When Gilmore struck oil on the property, he realized he was sitting on a gold mine. 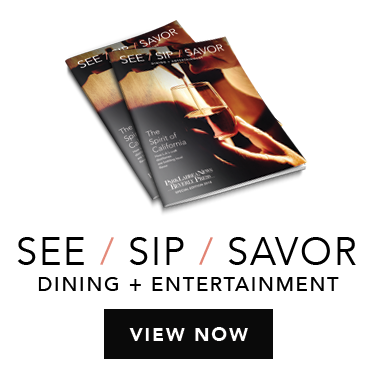 He called his newfound oasis Gilmore Island and developed it into a sports and entertainment center in the heart of Los Angeles. The Original Farmers Market is the last remaining vestige of Gilmore Island. Arena said A.F Gilmore was a visionary. 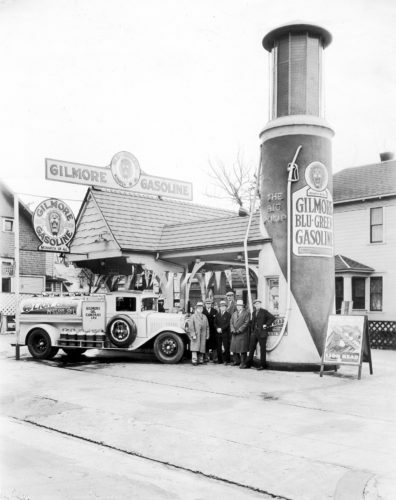 When automobiles became popular after the turn of the century, Gilmore seized the opportunity and began processing the crude into gasoline and motor oil. He remained a driving force in the early development of the automobile until his death in 1918. A.F. Gilmore’s heir, son, Earl Bell “E.B.” Gilmore, took over the property and was equally as visionary. E.B. saw opportunity in the growing city of Los Angeles and created Gilmore Gasoline, which helped fuel the new automobile craze. E.B. recognized the value of advertising and created Gilmore Oil’s mascot – the Gilmore Lion – to promote the brand’s Red Lion gasoline. E.B. sold newspapers for children at Gilmore filling stations. Children would urge their parents to take them to the filling stations to buy the newspapers, thereby introducing a future generation of drivers to Gilmore gas. Gilmore Oil opened the first self-service filling station – which they called a Gas-a-teria – at Third and Fairfax in 1938. It was followed a few years later by another Gas-a-teria on Beverly Boulevard near Genesee Avenue. Gilmore Oil operated until it was purchased in 1945 by the Socony-Vacuum Oil Company, a forerunner of Mobile Oil Company. However, Gilmore filling stations supplied gas well into the 1960s. E.B. Gilmore looked for other ways to profit from his land. The answer came from entrepreneur Roger Dahlhjelm and Fred Beck, who ran who ran a small advertising firm. They approached Gilmore with the idea of creating a marketplace for craftspeople and envisioned it as a place where local farmers would sell produce to people living in the surrounding neighborhoods. Arena said Gilmore wanted nothing to do with the crafts idea, but liked the prospect of farmers selling their produce. 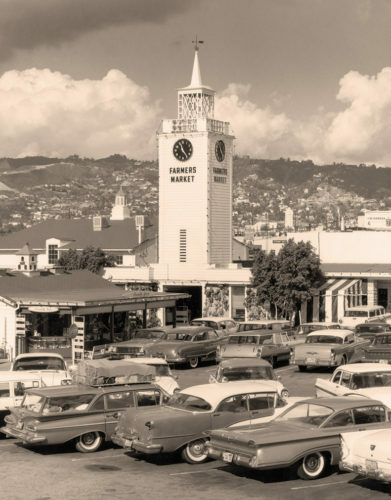 He granted Dahlhjelm and Beck permission in 1934 to organize a “famers market” and soon a dozen trucks were parked near the corner of Third and Fairfax. The early farmers paid 50 cents a day for the privilege of selling their goods at the site. Around that time, the market’s first food vendor arrived. Blanche Magee, a friend of the farmers who owned a food stand in the Grand Central Market, stopped by to serve sandwiches to the farmers. 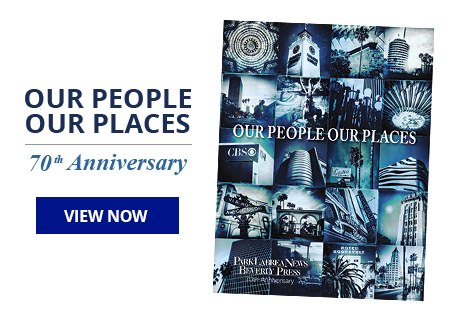 People loved the idea and Magee became one of the Market’s original tenants during its first year. Arena said Dahlhjelm had very high standards for quality that became a cornerstone of the Market’s success. Anyone caught selling substandard produce was quickly asked to leave. Crowds flocked to the Market, as they do today. E.B. Gilmore was always looking for ways to bring people to Gilmore Island. Auto racing was popular in the 1930s and E.B. started sponsoring racing teams, including cars that competed in the Indianapolis 500. The 18,000-seat Gilmore Stadium opened near the corner of Fairfax Avenue and Beverly Boulevard. E. B. Gilmore custom built the stadium for midget auto racing. Arena said the stadium was packed at the Thursday night races. The sound of revving engines echoed throughout the neighborhood. The cars, known as “thunder bugs,” could reach speeds of 90 mph on straightaways. Gilmore Stadium became a mecca for auto racing and teams from around the country competed regularly. Gilmore Field was also used for other sporting events. While the Rams are well known as Los Angeles’ first professional football team and are moving back this fall, few people know that another pro team once reigned supreme in the City of Angels. The Los Angeles Bulldogs called Gilmore Stadium home from 1934-45, playing in the Pacific Coast Professional Football League. Many Bulldogs players had been college football players for the USC Trojans and UCLA Bruins. The Bulldogs finished in first place in the regular season in 1937, 1939 and 1940, and won the Pacific Coast Professional Football League championship in 1946. Although the Bulldogs were the hottest team in town, football’s popularity grew throughout the country and the team soon faced competition locally. Gilmore Stadium’s gridiron was also popular on the silver screen serving as the setting for The Three Stooges short film “Three Little Pigskins,” featuring actress and comedienne Lucille Ball. Boxing was also popular and Gilmore Stadium hosted some of the greatest fighters of the day. Henry Armstrong, considered by many to be one of the best boxers of all time, fought Ceferino Garcia there in 1940 for the World Middleweight Title. The match ended in a draw. Other famous fighters who entered the ring included “Slapsie” Maxie Rosenbloom. The Hall-of-Fame boxer got his name because he was known to throw an unconventional open-handed punch once in a while, Arena said. While auto racing, football and boxing were the mainstays of Gilmore Stadium, it also hosted political rallies. Presidential candidate Harry S. Truman gave his famous “Stiff Upper Lip” speech there in 1948. Gilmore Stadium’s sister attraction, Gilmore Field, opened in 1939 and was home to the Hollywood Stars baseball team. The Stars moved to Los Angeles from San Francisco and played in the Pacific Coast League. 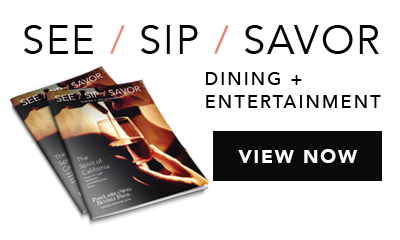 Prominent figures in Hollywood owned the team, including Robert Cobb, founder of the Brown Derby Restaurant, Cecil B. DeMille, Gary Cooper, Bing Crosby and Barbara Stanwyck. Hollywood celebrities would routinely be seen in the stands, and celebrities went to Stars games to be noticed. The Hollywood Stars’ archrivals were the Los Angeles Angels, who played at Wrigley Field in South Los Angeles. 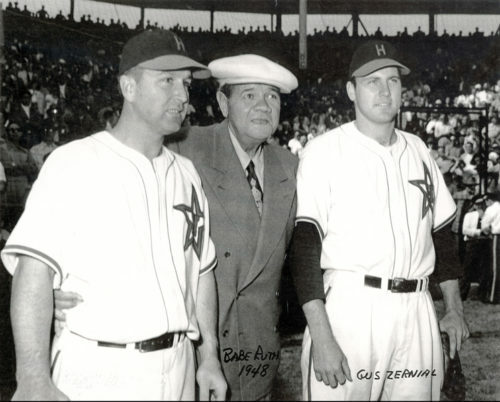 The Stars routinely beat them, winning championships in 1949, 1952 and 1953. Arena said the team had a good run until baseball became so popular that famous East Coast major league teams started scouting Los Angeles as a new home. The Stars folded in 1957, a year before the Brooklyn Dodgers moved to town. Gilmore Field also closed that year when real estate prices skyrocketed. CBS was looking for a place to consolidate its television operations on the West Coast and the parcel where Gilmore Stadium had been located was sold to the television network. Gilmore Field lasted a few more years until 1957, when the land was sold to CBS and became part of Television City. Gilmore Island even had its own drive-in theater on Third Street near Genesee. It had parking for 650 cars and fans flocked to see the drive-in’s first movie, “Silver River” starring Eroll Flynn. The drive-in was also ahead of its time, offering seating for walk-in guests before it closed in the mid-1970s. Pan Pacific Auditorium was an important destination on Gilmore Island. E.B. Gilmore sold a 13-acre parcel that is now Pan Pacific Park to Clifford and Phillip Henderson, well known aviators, in 1935. The theater’s distinctive Streamline Moderne architecture was designed by the Los Angeles Firm of Wurdeman & Beckett. It was built in six short weeks and quickly became a landmark on Beverly Boulevard when it opened in 1937. Pan Pacific Auditorium became a venue for sports, music and trade shows over the years. College basketball and minor league hockey games were played there, and it hosted the Ice Capades and the Harlem Globetrotters. Elvis Presley played two nights at the auditorium in October 1957, Arena added. Today, a gymnasium is located in Pan Pacific Park nearby where the theater used to be. The gym’s art deco design is reminiscent of Pan Pacific Auditorium’s design. Arena said the Gilmore Company’s pioneering spirit was the driving force behind the attractions located on Gilmore Island, and the family has never been afraid to take risks. While attractions like Gilmore Stadium and Gilmore Field eventually passed their prime, they represented firsts in the City of Angels. 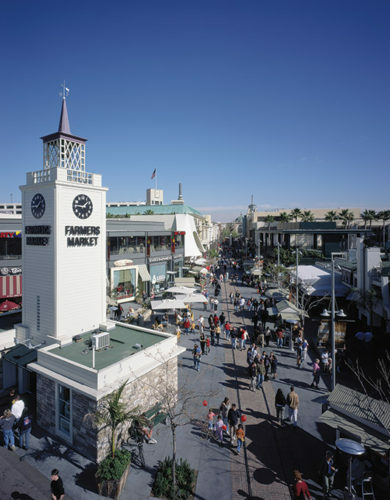 The property that now houses The Grove was leased to developer Rick Caruso and the shopping center opened in 2002. The Grove is run independently by Caruso, but is reminiscent of the attractions that people once flocked to on Gilmore Island. The Gilmore family residence, known as the Gilmore Adobe, is still tucked away on the property. While it is undergoing renovations, the adobe is not open to the public. The crown jewel of Gilmore Island is still the Farmers Market. True to its slogan, “Meet me at Third and Fairfax,” the Market remains a gathering place for Angelenos and visitors from around the world.